This section is from the book "Mrs. Allen's Cook Book", by Mrs. Ida C. Bailey Allen. See also: The Conscious Cook: Delicious Meatless Recipes That Will Change the Way You Eat. Break the shrimps into bits. Add the pimentoes to the butter and cook till soft, then add the flour and milk to make a white sauce. 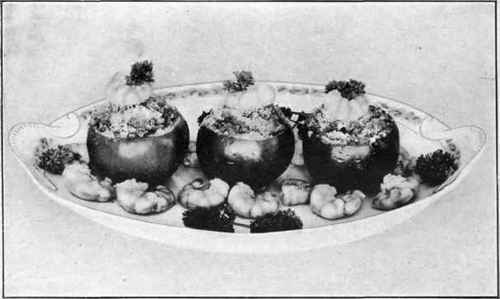 Turn in the shrimps, and season to taste; turn into individual baking dishes and cover with the buttered crumbs. Bake in a quick oven, and serve with radish and lettuce salad. Cut the tomatoes in halves crosswise, and remove the pulp. Dust the halves with salt and pepper and drain. Melt the butter and brown the onion in it lightly. Add the tomato pulp and cook till reduced one-half. Add the other ingredients, then the shrimp, and pack into the tomato halves. Cover with buttered crumbs. Bake thirty minutes in a moderate oven, and serve on buttered toast rounds, or garnished with additional shrimps. Cut the shrimps in small pieces, mince the anchovies and butter a baking dish. Put in a layer of the shrimps, then one of potato and one of peas; sprinkle with some of the anchovies, salt and pepper and flour, then repeat until all is used and pour over the milk heated to scalding point. Set on the crust slashed to let out the steam, and bake thirty minutes in a moderate oven.